The newest Korean/Mexican hybrid takeout, complete with basement vibes and local graffiti, have been moved t o put an item on the menu to support YWAM Nepal/Glocal Adventures who direct contact in Kathmandu Valley but also inland Nepal where greater destruction is evident. Their Nepalese kitchen staff have forged the nation's most popular dish, momo, and are selling them for $35 a pop, and all proceeds will go to a local charity in Nepal called. 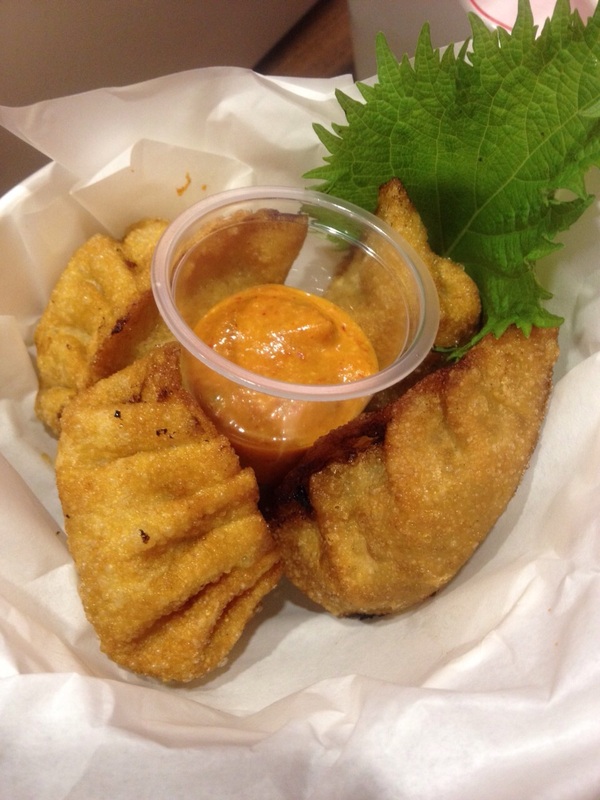 Momo also reflects a favourite of the South Korean people, mandu, and so if you are hankering after the local favourite then head to TaKorea soon, although owner Ah Young has said she will keep them on the menu as long as the funding is helpful. Good stuff! When: Started yesterday, end date TBC. This bar is most renowned for the decent price point for drinks and for the prominent DJs that spin tracks in the somewhat hidden space on Wo On Lane in Central. They've utilised these skills to support an ex-manager who was formerly based in Hong Kong, now in Nepal, Ritika Hima. Expect the likes of Cookie, Matt Brick, Paul Hitchens, Adrien Fernandez and Sven Schweizer to spin tracks tonight to raise funds for Ritika and her community. When: Tonight (Thursday 30th April) from 6pm. This coming Sunady from 4pm to 7pm, everyone's favourite indie mexican restaurant down a lane will be donating 100% of the proceeds Gorkha and Lamjung. For a donation of $350, freeflow food and drinks will be available. The Brickhouse team and friends shall be serving an arrange of homemade Nepalese dishes such as momo, alu dam, pakoras and samosas. 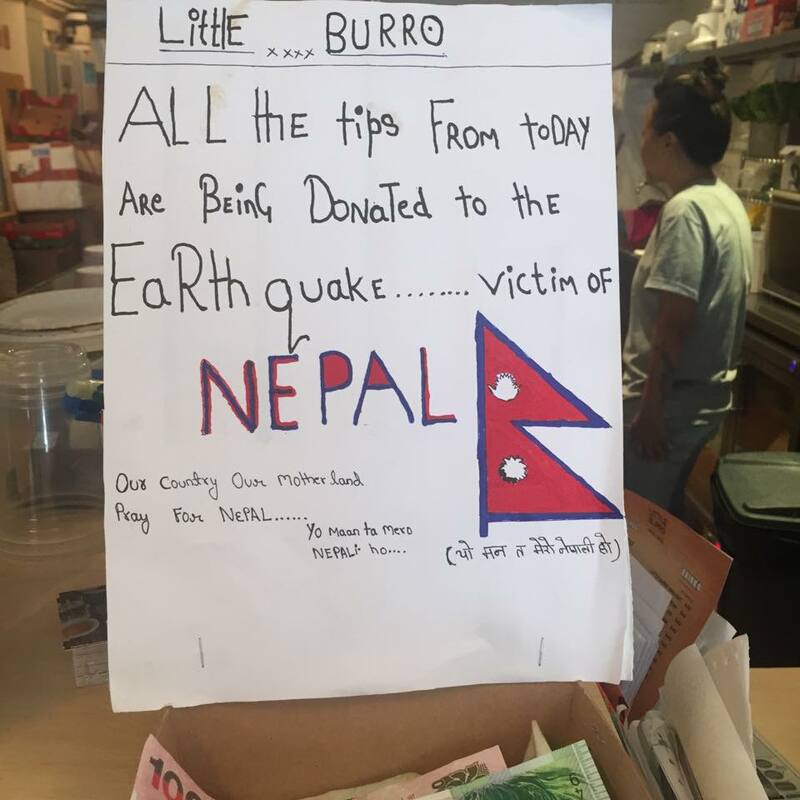 Given the majority of the staff at Little Burro are Nepalese, they decided to donate all tips colle cted this week to the victims of the Nepal quake. LB will be matching all customer donations, so are asking burrito lovers to please stop by this week to support their team and the wonderful people of Nepal. 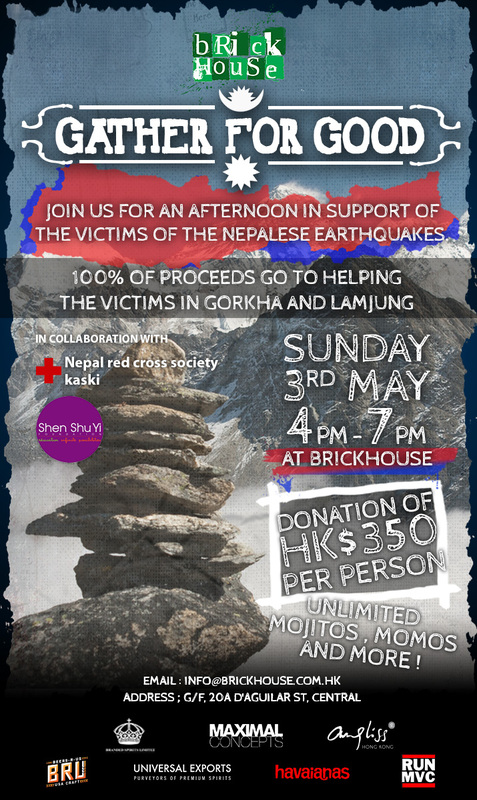 Levels club wish to invite the people of Hong Kong to come together to help raise funds for the devastating disaster in Nepal. They have invited everyone to join tonight at LEVELS and they will be donating 100% of sales to Hong Kong Red Cross's "Nepal Earthquake 2015” operation. Black Sheep Restaurants is hosting a charitable happy hour on Tuesday 5th of May at Boqueria and would love for you to join us. All proceeds from their happy hour will go to Hong Kong Red Cross to help those affected by last week's earthquake in Nepal. 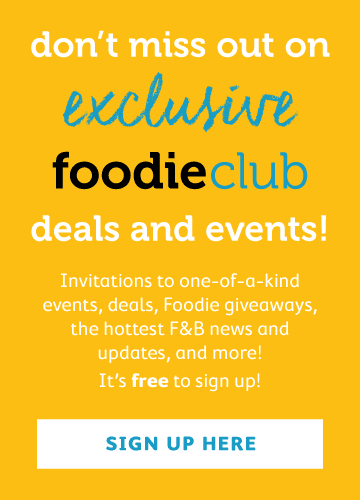 Free flow sangria, tapas and beer can be bought for $220. Press Room Group has launched a series of initiatives to support relief efforts in Nepal. A cocktail fundraiser will be held on May 5 from 9.30pm at The Pawn’s ‘Botanicals’ bar. In collaboration with Altaya Wines, Carlsberg, Moet Hennessy Diageo, Proof & Co and DJ Simon Pang, proceeds from the night will go to the Hong Kong Red Cross. From 30th April until 30th May, diners at Classified outlets and SML will have the option to add one dollar to their receipt while guests at The Pawn will be invited to contribute $5 to their lunch or dinner bill. All contributions will go to the Hong Kong Red Cross.